Lemon Drop Dress - Perfect Affordable Spring/Summer Dress! As this time of year rolls around and it finally starts to warm up and feel like Spring, all the cute citrus prints come out. I don't know what it is about lemon prints in particular, but I can't get enough of them! There's just something so crisp and fresh about them, especially on hot, sunny days. This dress is the perfect answer to all your lemon-print cravings! I just noticed it's back in stock and had to share with you all! The print is absolutely one of the most charming I've seen with its soft-yellow lemons and dainty black 'n white polka dots. I just adore it! A flounced hem and ruffle details at the bust, too? Sold. I can't get over the details. Too cute for words. The waist is elastic, too, making it the easiest dress you'll ever pull on. I love how simple and sweet it is and that you can wear it on or off the shoulders for a different look. It's flirty and fun and looks darling worn either way. I've layered a jean jacket over it as well for an effortless, weekend look. You'll never believe the price. $14. I'm dead serious. It's even less than it was last year! I'm giving you a head start on this dress because there's no way it'll last at this price, so if you missed out on it last year, go now before it sells out like hot-cakes again. It fits true to size, and I'm wearing size 0 for reference. It's not too form-fitting, and the material is soft and breathable -- perfect for Spring/Summer! Add a bamboo bag and a layered, gold necklace, and ankle-tie sandals and you're set. I love easy-breezy dressing like this; you can't beat it for hot, sunny days! Hope you're all having an amazing weekend and soaking up the gorgeous sunshine and warmer temps if you're in SoCal! 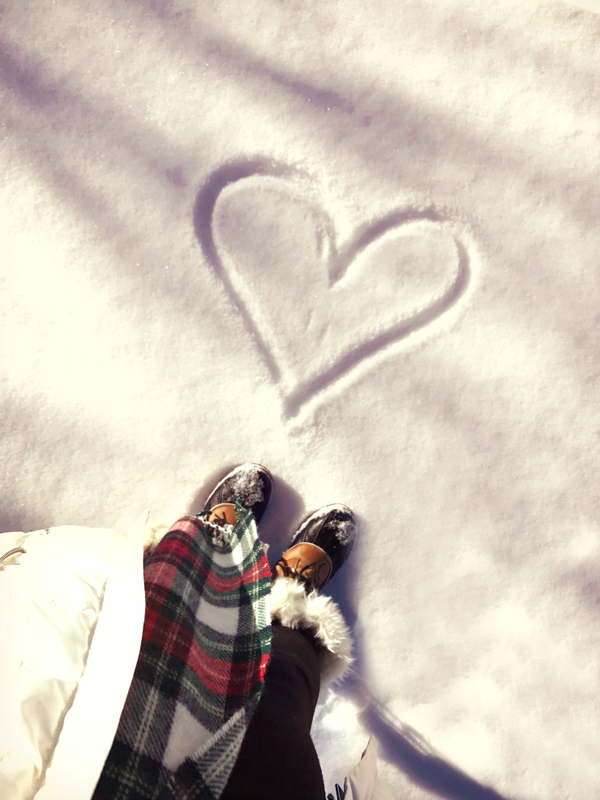 Sending warm-weather vibes to the rest of you with lingering winter weather! With Spring Break on the horizon (thank goodness!) and warm-weather getaways already in the works for several of you, I thought it would be the perfect time to share a few of my favorite recent vacay-style finds! 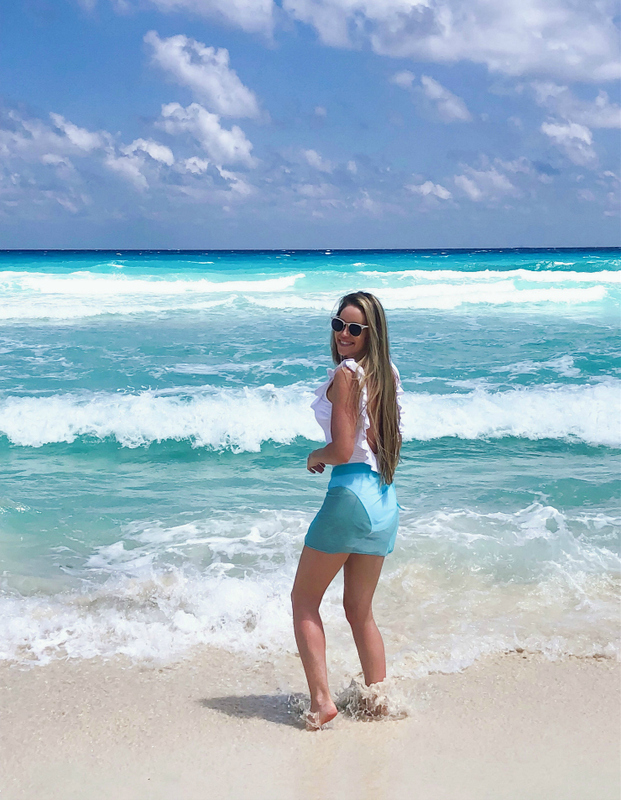 I'm counting down the weeks to our annual family trip to Cancún, so I'm excited to share all these goodies with you -- from swimsuits to cover-ups, accessories, and more -- all are coming along with me and I had to share! The best part? Most are in the $30-60 price range! Let's start with these two cute one-pieces, shall we? True to form, I saw the bow and said, 'yep, sold!' But it's not just the shoulder-bow detail that enticed me; it's the color! Labeled 'Sundrenched Peony' it's the prettiest lilac shade that is so lovely and flattering on any skin tone. I have zero tan right now, but I can see this lilac color looking even more striking with a tan or against darker complexions. There are 6 other beautiful colors to choose from in this style as well, including a pale mint, bright cerise, and a classic navy and black. Just note that certain colors in select sizes are on back-order, so be sure to click on the color/size you want to check availability. You'll want to ensure your suit will arrive before your planned vacation. I snagged this suit on sale several weeks ago, making it only around $60, and just noticed it's back on sale for a limited time only -- see below! This fuchsia number is another winner. The color is just stunning! This suit comes in a pretty dusty-blue color, too, but the fuchsia was my instant favorite. And the ruffle details are so fun and flirty! The front dips down a bit but is still fairly modest for us mamas. This suit is also lined with removable cups and fits nicely without pulling or tugging. I sized up to a Small and it fits perfectly. One of my favorite details, though, is the criss-cross back. See what I mean? So cute! I love the ruffles at the top of the shoulders and also the center strap across the back that allows you to adjust the fit to your liking. Can you believe this suit is only $30?! I love finding classic styles like this for less! Snag this one while you can because I see sizes are already going fast. And no wonder -- I can see this suit being on rotation every year! If you love seersucker, I ordered this oh-so-pretty seersucker one-piece in the blue/white color. It comes in a blush/white color combo as well, making it so difficult to choose between the two! You have to see it -- it's darling! *Sale Alert: It's now on flash sale for 50% off, making it only about $44 with free shipping! Go! I also ordered this pink one-piece and these blue/white striped bikini pieces here and here to try! I'll try to post an update in this post once they arrive. My favorite white one-piece from last year is back in stock in a few sizes! Yes!! If your size is available, snag it now because it will definitely sell out again. I can't say enough good things about this one. I've styled it a variety of ways, from striped wrap skirts like the one above to longer midi-length skirts like this one and this one. It looks so adorable when worn as a 'top' when you need to step out of the pool/beach for a quick bite or just want to explore the resort. At only $40, it's a steal for a timeless, versatile swimsuit that you'll reach for over and over again. If your current size is sold out, try this white ruffle swimsuit which is similar and would be in my cart if I didn't already own the previous one. See my blog post from last year for more photos, my review and sizing details. This striped dress is back in stock in the light gray/white stripe combo and is only $17! It's such a darling dress for vacation and was one of my favorites for Cancún last year! First of all, it has pockets! And the buttons are actually snap buttons, making them super easy to open/close yet still sturdy enough to prevent accidental peek-a-boo incidents. It's unlined but the fabric is a nice, medium weight that feels similar to a thick cotton. I love the square neckline of this dress as well as the thicker straps (no strapless or special bras needed!) and the midi length -- so many pretty details packed into one $17-dress! 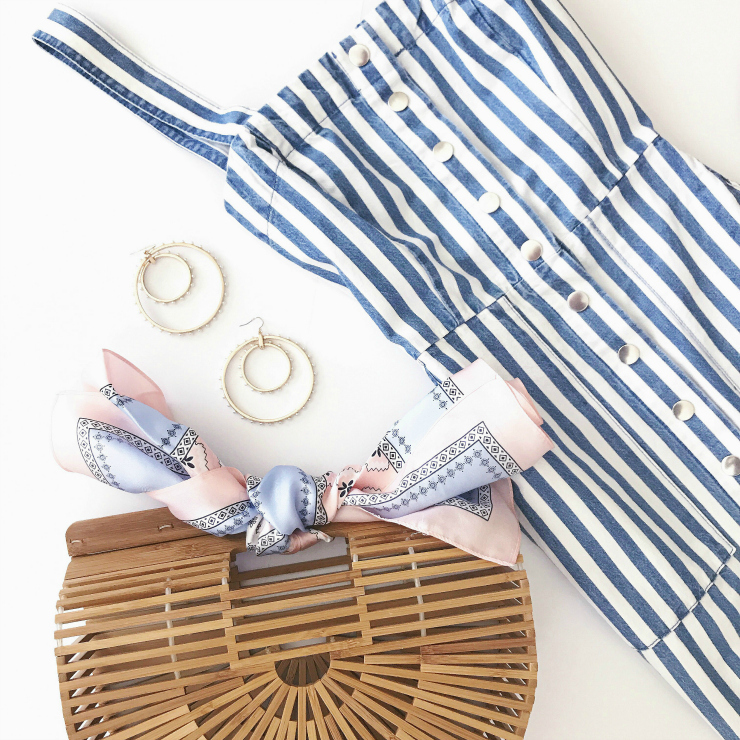 If you prefer the blue/white stripes more, I'm crushing on this dress, too! This quintessential vacay bag is also back in stock and only $30! I like to tie a cute scarf around mine for an extra pop of color/pattern. This popular button-down dress now comes in new colors/patterns this season! Click here to see the options! If you don't have a button-down dress like this already packed in your vacation bags, you need to remedy that stat. These dresses are comfy, cute, and easy to throw on and go! I just roll mine up in my luggage to prevent wrinkles and I'm set. If you love this style, I found this polka-dotted one with pockets, and can't wait to try it on. Note that the item description online says, "floral" when it's clearly not; it's polka-dotted and so cute! I'll share this one soon, too. Meet my new favorite cover-up! I always gravitate towards crochet cover-ups for vacation, so when I came across this one for only $19, I had to snag it. It's the perfect piece to slip on over your swimsuit for a touch of modesty and style at the pool/beach. I love that it can be worn off one shoulder like I'm doing here or fully on the shoulders. Here's a closer look at the detail. I love the lace and contrasting trim at the neckline and hem -- so intricate and pretty! It's one size-fits-all (not sure why the item description shows "Medium" since reviews show it's one-size-fits-all) but fits nicely without being too snug or too boxy. There's a string-tie in the back across the shoulders to keep it secure, too. If you're petite like me (I'm 5'2), this is a great petite-friendly find for vacation! This is the white color, not beige. I ordered this open-front one to try, too, based on its many popular reviews. It's another cute, affordable option at only $20! The open-front styling is perfect for showcasing your favorite swimsuit while still having a subtle layer of coverage for modesty. It ties at the front, too, so you can close it for more coverage as needed. 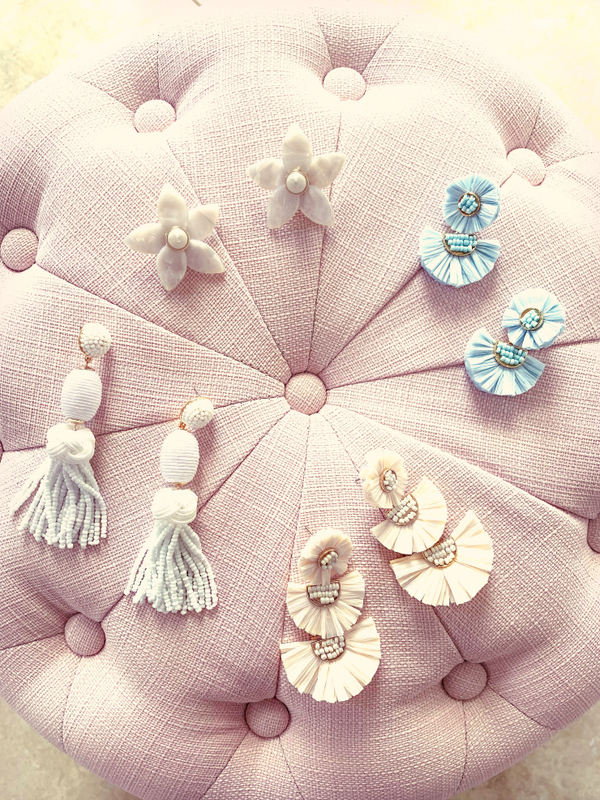 Statement earrings in a variety of colors and styles always make a re-appearance for vacation! I generally wear pearl and gold stud earrings daily, so it's fun to experiment with new, colorful and bold earrings for my getaways; I love how statement earrings can totally change up the look of any outfit! I just added this super-cute black and white one-piece to my rotation and love it! It just came in the mail and I snapped a quick photo for you. It's amazing! I'm blown away that this suit is only $29 and ships for free! I'm wearing size small and it fits perfectly with plenty of stretch/give. It also has nice, modest coverage in the back. The black, mesh trim is elastic, making it easy to put on/take off and allows it to conform to your shape, and the white portion of the suit is thick and lined. This is a great, classic swimsuit that's affordable, modest, yet still super flattering. I plan on pairing it with this palm-leaf pareo (only $14!) for a fun pop of print when it's time to grab lunch. Highly recommend both! This darling cover-up also just arrived, and I'm so pleasantly surprised with it; it looks way better in person! This is a great dupe for the pricier Anthropologie Farm Rio Havana dress from a year ago or so; it's the same exact print! It comes in a maxi length here, but I actually prefer this shorter one so much more! The water-color print is so beautiful, mixing soft and dark pinks, sky-blue, coral, melon, green, and so many other pretty shades. The pom-pom trim at the hem and the string-ties at the shoulders (which are fully functional and allow you to tie and adjust to your liking) make it all the more sweet! I'm wearing size Small and it fits and drapes nicely. This cover-up may be my new favorite, along with the crochet one above, because it can be worn as a sundress, too! Just layer a tank and half-slip underneath for modesty since there's no lining on this one. Hope you love these pieces as much as I do! To keep things simple, here's a full round-up of my top vacay picks by category! As I come across more great finds, I'll be sure to share them with you all! I may put together a "2019 Vacay Style - Part 2" post. Also, I've updated the VACATION SHOP page here on the blog so you can access/shop these items easily without having to search for this specific post. I hope this helps with your upcoming Spring Break or vacation plans! And if there are any items you're especially loving or would like to see included, please let me know! Style Finds: Dresses for $50 or Less! I hope you're having a great weekend so far! I'm popping in with a quick round-up for you. Several of you have asked for more budget-friendly style finds, especially dresses in time for V-Day next week. You know my affinity for dresses, so how could I say no? I was elated to find so many closet-worthy options to share with you all, aka the hidden gems. So whether you're celebrating Valentine's Day (or Galentine's Day) or have sworn off the very notion of it and just want something cute for every day, I've got you covered! All of these dresses are $50 or less! They're feminine and pretty with a touch of fun and flirty. And they'll take you right into Spring, so even better. I had so much fun sourcing these, and hope you love them as much as I do! Just click on any of the images in the above collage (it's clickable) or scroll down to see more favorites. Lilac Love // Gal Meets Glam Re-stock Alert & Sale! Craving a little Spring-style inspo? I know I am! I'm so excited to share this gorgeous Gal Meets Glam dress with you all since it has recently popped back in stock and is now 60% off, making it $60! This dress has been out of stock for nearly a year now, which is actually when I first shot this look. I was forced to put these photos and this blog post on the back burner for awhile since this dress flew out of stock. I know most of you gals like to get your hands on the actual items I'm wearing, so I didn't want to share a post featuring a dress that was already sold out, especially since I couldn't find any similar options. Click here to see all the other lovely Gal Meets Glam dresses that are now up to 60% off! This soft, lilac color and the dainty, feminine ruffles on this dress had me at 'hello.' It's so darling! Made of a nice, crepe fabric, it's soft and lightweight, is fully-lined, and zips smoothly up the back. It would be so pretty for any upcoming Spring events like weddings, bridal showers, baby showers, or lunch dates. But it's cute for any day, really, because it looks beautiful dressed up or down. For a casual weekend look, just throw on a pair of strappy sandals and a tipped cardigan for contrast. I went with a dressier look here, adding floral slingback pumps, a vintage wicker box bag, and a cropped cardigan with embroidery details to play off the vintage theme of the bag. I had the kindest onlookers compliment me while I was shooting this look (a bit awkward at times, but comes with the territory of blogging) and was told this look was very 'First Lady' (or FLOTUS.) I smiled and replied, "Wow, thank you -- I'll take it!" I love that it's petite-friendly; I find most of the Gal Meets Glam dresses to run a tad large and long for my frame, so I was thrilled to see that petite options were being introduced in several of the newer styles. I'm wearing size 0 since that was the smallest size available, and it runs a little wide in the waist and hips on me. That said, it drapes and flows nicely, so I haven't altered it and think it looks fine despite the looser fit. The flirty hemline falls just a couple of inches above my knee (I'm 5'2, for reference) but still looks ladylike and demure. Any shorter and I'd feel uncomfortable, but that's just me. I've always preferred longer hemlines. The only shopping deterrent may be the price point of the GMG line. It's priced in the same range of Kate Spade, with dresses that can run anywhere from $150 - 500 each. Ouch. They're beautiful, no doubt, but I rarely splurge on dresses in this range unless I have a special event and need something with a 'wow' factor stat. But now that I've found these dresses at discounted prices, I'll be more tempted to shop all the pretty selections, especially with Spring fast approaching. Scroll through to see all the other pretty dresses on sale! 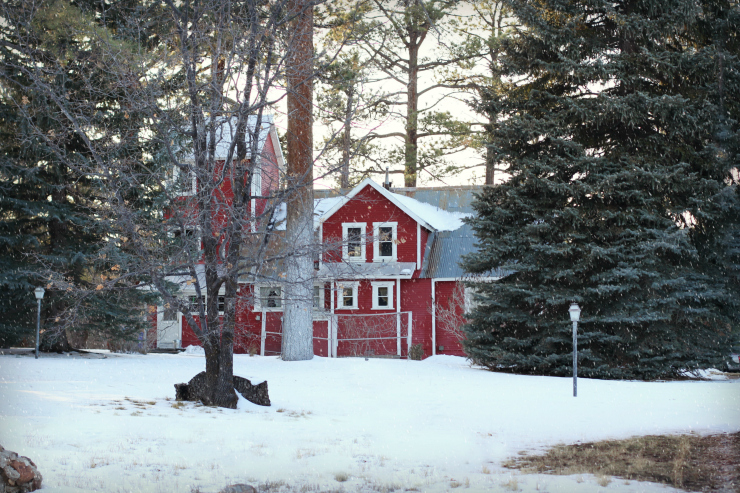 Are you eagerly awaiting Spring, too? I hope your year is already off to a wonderful start! It's been awhile since my last blog post, and if you've been following me on Instagram, you know that I took a break from social media and blogging in general to focus on other pressing projects. I've also been making a conscious effort to be more present with family and friends and put down my phone and step away from the computer. Sometimes it's a much-needed break; I love blogging as a creative outlet, but at times there are just other things that require my attention. Not to mention, I have 3 little ones to look after, so it's important that I don't sacrifice quality time or energy with them, especially since they're growing like weeds! Moving forward, I will do my best to blog when I can, and keep future posts brief and more photo-centric (less wordy.) The goal is to keep it simple and sweet. 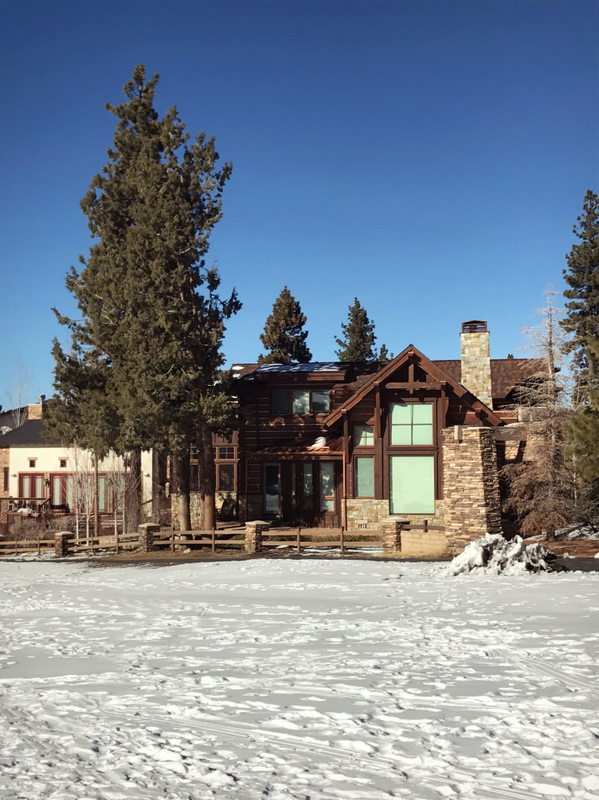 Travel tip: Late November through early January is peak season at Big Bear, so if you're wanting to visit it during the holiday season, try to reserve your cabin/vacation rental early to secure your reservation. 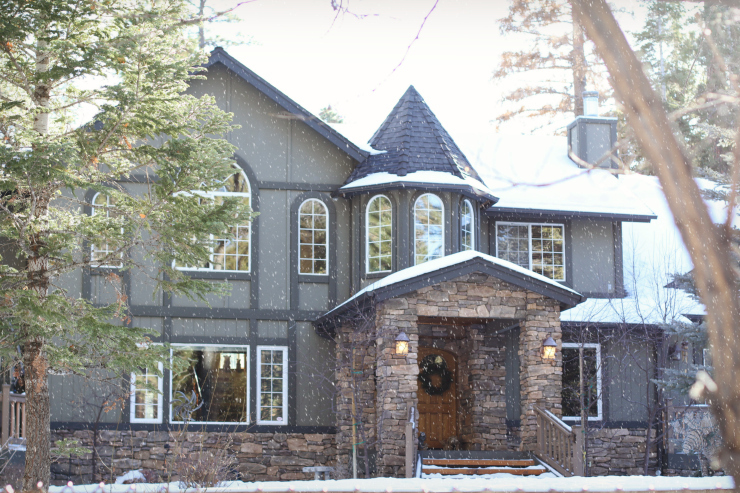 Rentals book up quickly and you may be looking at well over $1,000/night for your stay. 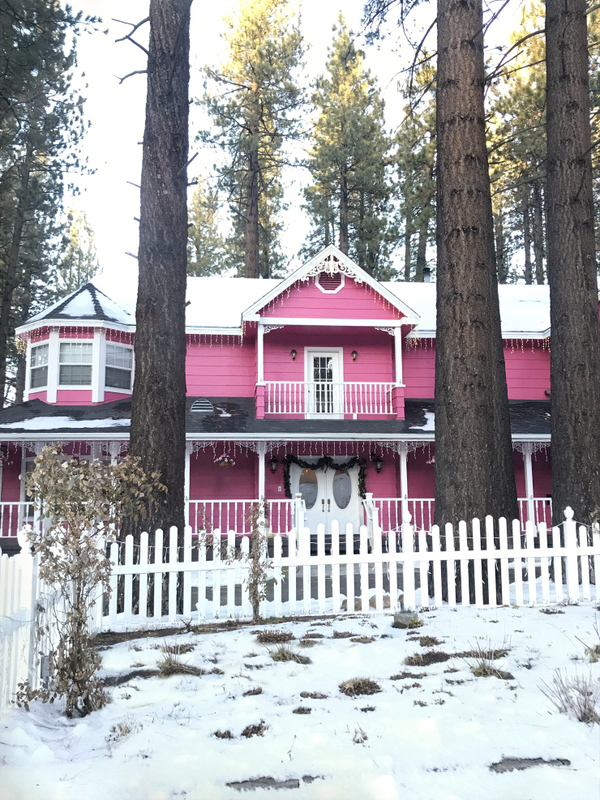 Because we had a large group, most of the larger cabins had already been reserved, but we were fortunate to find a beautiful, spacious, 2-story cabin near the lake and snow resorts through CoolCabins.com. (See their FAQ page for helpful information.) 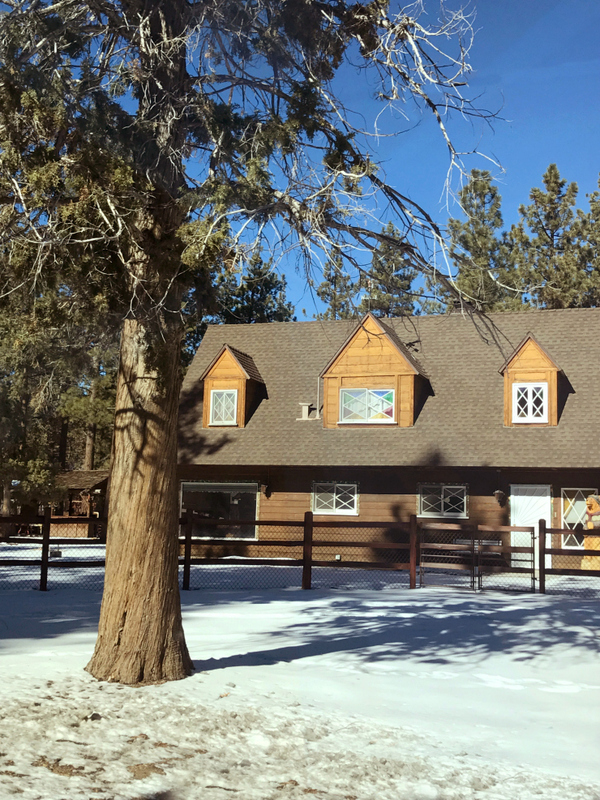 Be forewarned: prices are steep during peak season, especially for the larger cabins that accommodate 10+ guests. Split among all of us, it was a little more reasonable, but still pricey nonetheless. 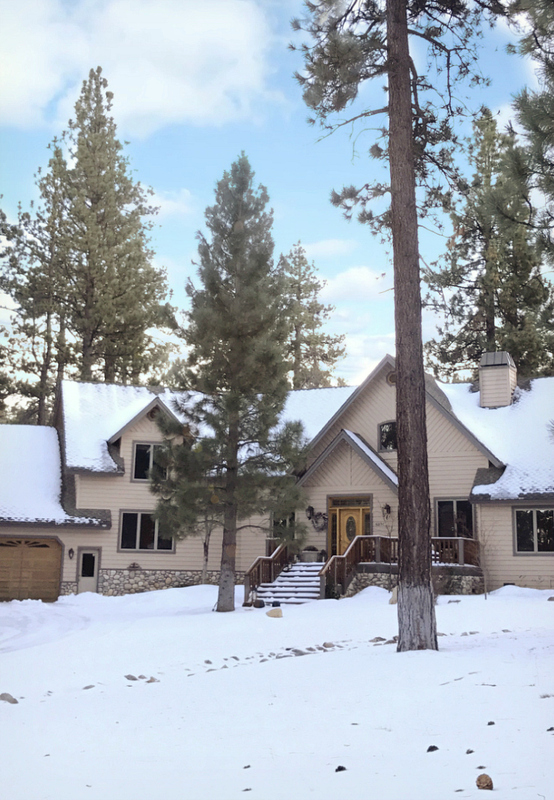 Each cabin has its own owner, contract, and stay requirements, so be sure to review those carefully prior to booking. Some cabins are pet-friendly as well. For this trip, I knew layers were an absolute must, and kept my outfits simple. I packed several pairs of leggings and thermals to help combat the cold and often wore 2 - 3 layers of pants just to stay warm! I bought these black, fleece-lined leggings at TJ Maxx, which I also found online here and similar here. I've never heard of this brand, but for only $8, these babies kept my legs nice and toasty, so they're now a winter staple for me. 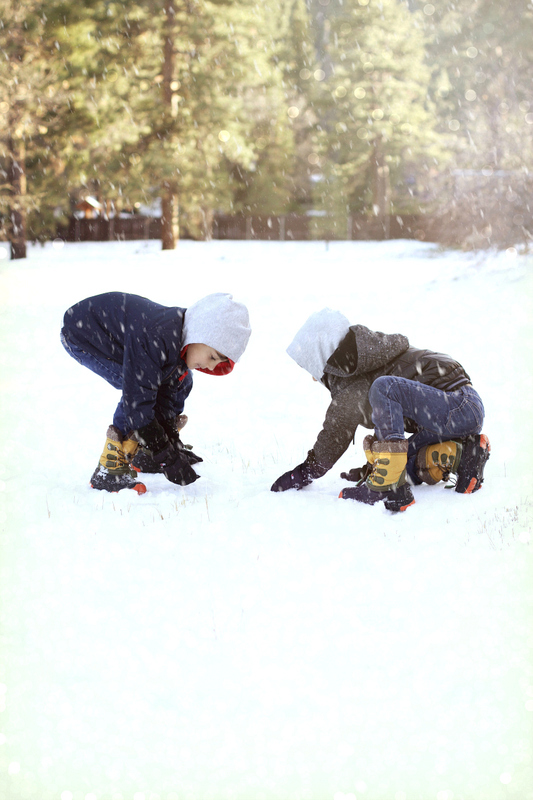 They're not waterproof, so if you plan on all-day sledding, skiing or snowboarding, you'll definitely need snow pants. I have an old Burton pair I use for snowboarding, but didn't wear them for this trip. These are similar in pink if you need snow pants. These may work for petites also. Huge, fluffy blanket scarves were also a lifesaver! If you still don't have these in your winter rotation, you need them stat! They're not just a trendy fashion prop featured by every blogger under the sun; they truly take you from miserable-cold to tolerable-cold. Trust me, I now have a whole new appreciation for them! This pink plaid scarf was my favorite and most-worn one throughout the trip because it feels like a cloud -- soft, cuddly, and warm (almost to the point of suffocation, at least during snow-play.) Once you take it off, you immediately feel the difference. I just draped it around my neck and let it hang down and that did the trick for me; not too hot, but still plenty warm. I found a couple of other similar scarves here and here that also look cute and snugly. My pink Hunter boots got plenty of use as well! I initially purchased them with only rainy days in mind, though they're scarce here in LA, but I have to say, these held up nicely in the snow as well. I wear the big kids' size 4. Just add a pair of thick socks (I layered 2 pairs for extra warmth) to keep your toes from entering frostbite territory. Rubber boots = no insulation. My beanie is another find from the kids' section and on sale now for only $7! I have a smaller head, so I was happy to find this one that fits perfectly. It must run large for kids because the smallest size fits me (1 1/2-4.) Strange, but it works for me! It's beautiful! This coat is extremely well-made and looks even better in person! I was immediately impressed with it when it first arrived, especially with the fit and design details. I purposely searched for puffer-coats with a belt to cinch the waist and give it a more flattering shape. This one definitely does the job with its simple buckle-belt (just press to open as you would a seatbelt) while still keeping you nice and warm. The removable, faux-fur hood and the softly-lined pockets are a really nice touch as well. I snagged this coat on sale during a flash-sale event, but see it's now on sale again for just over 50% off with free shipping! The price point is a steal for this coat, and I highly recommend it for you petite gals wanting a stylish and practical puffer-coat. I also found it in more sizes here, starting in size XS for just under $100! If you love this one as much as I do, act quickly while it's on sale! The ear muffs were my favorite find since they were in the kids' section and were a steal! I love that they're adjustable, too -- perfect if you have a smaller head like I do. My daughter would steal them, too. ;-) If you can't get your hands on these exact ones, these and these are also cute. Okay, the belt wasn't exactly practical, but it lent a dressier look for lunch/dinner outings, so it made an occasional appearance. This one was wait-listed (6 months?) since size 65 is perpetually out of stock everywhere, but I did manage to get my hands on one. That said, I've always held the view that if you're not wanting to invest in a designer belt, any slim waist belt would work just as well for this look. These boots are the best Sorel dupes! I've had mine for about 2 years now, and the quality is still holding up nicely for boots that were roughly $30. I love the Sorel line, but knew the cost-per-wear for me wouldn't justify the price. Unlike my belts, I rarely use winter boots like these, so I went with the budget-friendly option. We got some amazing family photos this trip and made so many wonderful, new memories. I'm grateful for trips like these with my favorite people. One of my goals this year is to remember to invest in family and experiences over things. What are your goals for the year? 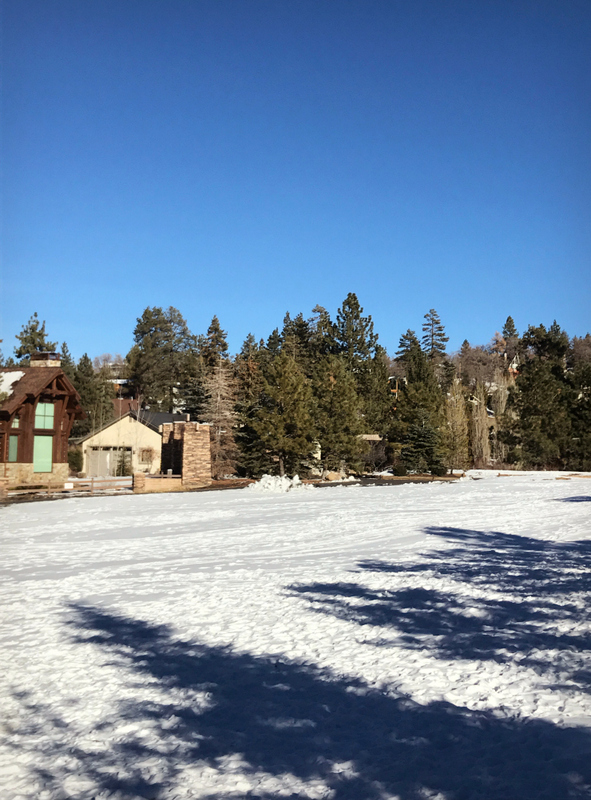 Have you ever been to Big Bear? Thanks so much for stopping by! It's time for me to go relax with the babies by the fireplace and enjoy this stint of rain we're getting in LA this week!